That is something you will hear the kindergarten classes at KIPP Central City Primary — and at all KIPP New Orleans primary schools — say every morning. Students proudly wear T-shirts declaring to the world that they will be going to college, so watch out! Ask any scholar who attends a KIPP New Orleans school what year they are going to college, and they will proudly answer in a very determined and assured voice. To and Through College. It’s a commitment that all KIPP New Orleans Schools (KNOS) team and family members and students make every day. Of the KIPP Renaissance High School Class of 2018, 99 percent of students were accepted into an institute of higher learning. The KTC team is central to the success of KIPP New Orleans Schools (KNOS) students attending and completing college. They actively support more than 1,500 KNOS alumni, as well as nearly 450 KNOS high school seniors and 400 juniors as they prepare for college. While primary and middle school students are certain of their year of matriculation and are surrounded by positive re-enforcements, such as college pennants, classrooms named after universities, and signs displaying their teacher’s alma maters, the real work begins in earnest in eighth grade. Alex Kuehr, Manager of High School Transition, oversees the Education Opens Doors program for KNOS eighth graders, which gives students knowledge and tools they can use now to make them the best candidates for college in the future. The program, which is offered in all four KNOS middle schools, is designed to provide the college knowledge and soft skills students need to navigate high school with a clear path to college. KNOS is the first school outside of Texas, where the program originated, to offer Education Opens Doors to students. “We wanted to make sure our students were leaving eighth grade with the knowledge and skills to be successful in high school, no matter where they went,” Kuehr said. Throughout the course, students design and follow a roadmap that illustrates the potential pathway to their desired future. Students take career aptitude tests, learn about class rank and grade point averages, time management, study skills, write a resume, the college application process, and how to compare financial aid packages. They even review the course guides for both KIPP Booker T. Washington and KIPP Renaissance high schools and map out their potential classes for the next few years. “The cool thing is having students really start to think about how what they are doing in eighth grade will set them up for success in ninth grade and how success in middle school translates to success in high school,” Kuehr said. This class gives students the space to think about college and career in a concrete way and to develop a self-awareness regarding personal preferences and potential best matches when it comes to considering the right colleges. Once the students move into high school—be it a KNOS school or another New Orleans high school—KTC works with them, beginning their freshman year. The KTC team helps KIPPsters become involved with extra-curricular activities and opportunities to make them well-rounded students, as their teachers keep the scholars focused on their GPAs and the appropriate course workload. Starting in their junior year, KTC counselors work with scholars to compile a wish list of colleges, as well as take students on college campus visits. At the end of their junior year through the early months of their senior year, students work with the KTC College Counselors as part of the Match program to start discussing the big questions and making choices regarding their futures. The program is designed to help students find the right college match that fits them academically, financially, emotionally, socially, and geographically to help them best prepare for their future career. “We help students backward plan,” College Counselor Dan McGrath said. The first meeting with counselors tends to focus on life and career goals, and subsequent conversations are then planned backward from there: which colleges, programs, or pathways will get them to those goals? What next steps do they need to take to get access to those options? Throughout the fall and winter, McGrath and other counselors assist students by reviewing their college applications, meeting with families to help them plan for the costs of college, and assisting in the search for additional scholarships. Once students begin receiving their acceptance letters, they and their families meet with a KTC team member to discuss which option is the best match for the student. One of the highlights of the year is the annual Senior Signing Day held in late spring when each senior announces where they will be attending college and what they will be studying. Getting to college is just the start. Support for KNOS scholars doesn’t end at graduation. The KTC Persistence Team supports with KNOS alumni with financial, academic, and even emotional, whether students enroll in college or join the work force. Both Cornelius and Murphy began their careers as teachers with KNOS and were working at KIPP Renaissance High School (KRHS) when the first class of seniors graduated in 2014. It was then that alumni advising efforts really began in earnest. 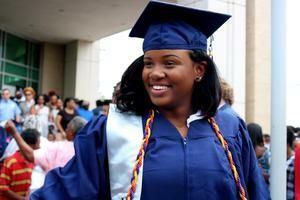 KTC New Orleans is tailored to meet the specific needs of KIPP New Orleans Schools alumni. This means the team works to establish contacts at universities throughout Louisiana, Texas, Mississippi, Alabama, and beyond to make the most of campus resources available to students as well as to learn how to best navigate them. Coty Lovelady, a KTC alumni advisor, supports nearly 200 former KNOS students enrolled in college by helping them solve problems, find resources, prepare for degree audits, jobs and internships, identify mental health resources, and build partnerships across the city and state. He often visits their college campuses and offers any assistance to help alumni stay on track to graduate. KNOS alumna Laundrell Jones, a junior University of New Orleans, said it is a blessing to have someone assisting her in taking her education to the next level so she could better yourself. Beyond that, KTC offers a donor-supported College Persistence Fund to assist students who need help purchasing books, flights or bus rides home when campuses and cafeterias are closed for the holidays, or help paying for an unexpected expense that could make the difference whether a student stays in college or drops out. KTC has also launched KIPP Corps, an opportunity for KNOS alumni enrolled in college to work in KNOS schools as paid interns. “This program helps fill the need of work-study with flexible hours that is often hard to come by while giving our alumni a chance to reconnect with KNOS and help meet the needs of our current students,” Cornelius said. Richelle Peck, junior at Dillard University, has worked as a guided reading instructor as part of KIPP Corps at KIPP East Community Primary for the last two years. “I am also very thankful for KIPP Corps because it allowed me to experience the teacher perspective of life, and how touching it can be to students and you may never realize it. It also allowed me to be ahead for book money next year, which is a great help!” she added. The KTC team also sends care packages around midterms and finals and holds an annual crawfish boil and a networking dinner for students attending colleges out of state. "Despite being way in Boston and at a music college, I don't know where I would be without KTC. The useful study tips, helpful advice for waking up for early morning classes, and opportunities that they reach out about have made a big difference in my college experience,” said Brandon Shelton, a senior at Berklee College of Music. After KNOS alumni complete their first year on a college campus, they are invited back to KRHS for the annual pennant ceremony. The purpose of this ceremony is two-fold: to recognize the major accomplishment of KRHS alumni in completing their first year of college and for the current KRHS students to see that the goal they are working toward — to and through college — can be the same reality for them that it is for the alumni. For KTC, it isn’t just about finances and logistics; there is also a level of emotional support and friendship KNOS alumni receive from KTC members. “From health scares to family deaths to just being overwhelmed by life, we’ve dealt with it all. I even got to watch a marriage proposal. Our alumni have our phone numbers and reach out to us with the good and the bad. We are always there to talk though any situation with them. We really do become family,” Cornelius said. The work KTC does is expanding throughout the city, as other charter schools begin to establish similar programs. Together, New Orleans high schools and colleges are collaborating to help our students persist and graduate at higher rates. “The one-on-one coaching model is great, but on a citywide scale cannot continue, so we need to work together to see how colleges and universities can help address the persistence challenge we face,” Cornelius said. The impact that KNOS will one day have on the world is immeasurable, but the beginnings of it can be see it today as life has come full circle for four KNOS alumni. Gaismen Campbell, Jean St. Felix, Erinique Little, and Nigel Palmer, all recent college graduates, have returned to KNOS as teachers themselves. Want to support KIPP New Orleans’ KTC program? Donations to the College Persistence Fund can be made online on the KNOS website.